Deputy Chairman of Ho Chi Minh City People’s Committee yesterday requested related agencies to closely work together to curb and impose penalties on violators who illegally exploit, sell and transport sand. The Department of Transport yesterday said Deputy Chairman Tran Vinh Tuyen has assigned police force and border guards to handle violations including illicitly dredging and exploiting sand in rivers and canals. Police officers and border guards should coordinate with their peers in neighboring southern provinces of Dong Nai, Tay Ninh, Binh Duong to patrol along Sai Gon, Dong Nai rivers and other paths in order to issue fines to violators. 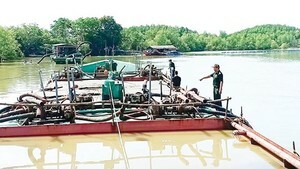 The Departments of Transport, Natural Resources and Environment and related agencies should increase supervision over dredging projects because violators can take advantage of sand dredging privileges authorized by the Government for illicit exploitation to rake in huge illegal profits. Sand mining erodes farm land in localities; accordingly local authorities have made concerted actions against illegal mining.